In today's female vocalist market, the competition is steep. In the jazz vocalist genre, it's simply overwhelming with the number of female jazz vocalist entries attempting to gain public favor. Often times the gatekeepers of music reviews, airplay and promotion are tabling these cds they receive for another day and the stack continues to grow. And, that continual glut makes the ascendance of Lyn Stanley all the more impressive. She's gone from an unknown to now selling over 34,000 albums worldwide since her first release, earning her title as International Recording Artist. 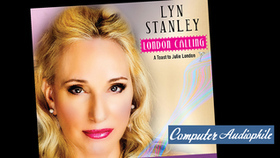 To this challenging market in 2013, enters Lyn Stanley with her debut album, Lost In Romance. Lyn was a retiring corporate marketing executive and adjunct college professor with no music background. But, as luck would have it, her first introduction to the music world was through Ella Fitzgerald's conductor and accompanist for 25 years, jazz pianist, Paul Smith. Smith heard Stanley's voice and knew she was unique. He had her on stage with him and his trio four months after their first encounter. 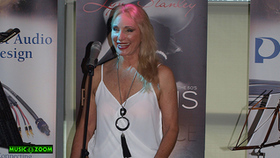 This was a jump start the fast paced musical journey Lyn Stanley now enjoys. Lyn is about to release her 5th album, The Moonlight Sessions Volume Two (Volume One released on May 30, 2017) since 2013 and has released an additional holiday single in 2014, Little Drummer Boy. 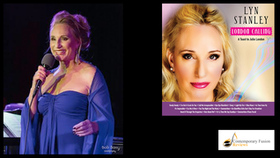 She's been a regular on the CDBaby.com #1 jazz vocal position on all her releases to date. 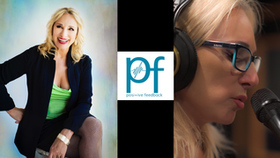 And reviews of her work are worldwide in the audio world for pristine sound recordings. What may be intriguing about this story, is this relative newcomer to music has been accompanied by some of the all time music greats in today's jazz arena. 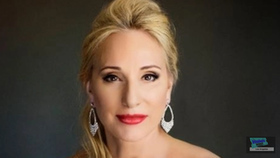 These players have encircled Lyn Stanley with not only their wonderful playing but also invested arrangements they conjured up to meet her creative objectives. 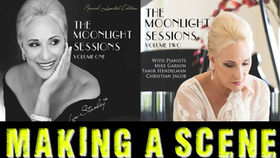 Her latest projects, Interludes and The Moonlight Sessions Volumes One and Two, have Mike Garson (David Bowe's pianist and conductor for 35 years), John Chiodini (Peggy Lee's guitarist for 25 years), Joe LaBarbara (Bill Evan's drummer) are among the players Lyn hires who virtually meet the "who's who" list of extraordinary musicians. 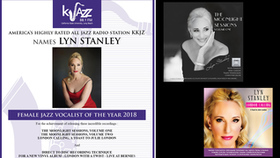 Lyn's recordings have garnered Global Music Awards for Best Album and Best Female Vocalist for Interludes and The Moonlight Sessions projects. Radio airplay for artists can also be an even greater challenge for both promoters and station programmers as they whittle through the sea of music passing their desks. Lyn has managed to gain momentum with each release in this area. Her latest project, The Moonlight Sessions, got nearly every track of Volume One added to the largest radio audience (600,000) for one station, KKjz, a Global Jazz, Inc. station based in Los Angeles. 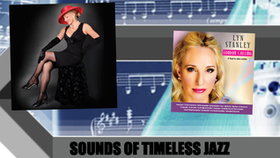 KKjz owner, Saul Levine, proclaims Lyn to now be one of the "most outstanding vocalists" in today's jazz. 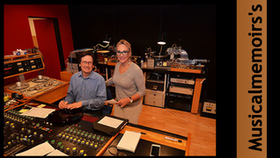 Arranger/composer Sammy Nestico calls Lyn "a great talent" with a beautiful voice and winning style. She's quickly earning the critic title of "sultry jazz" diva of the decade with her deep, rich tones and emotive lyric delivery. Lyn was in the vanguard of the return to vinyl craze we are currently experiencing. She sells about twice as many vinyl records as she does CDs. She chooses her songs experientially. "I've been through a lot, " she states, and if I don't have it in my background, I can't sing it. When singing, I try to see in my mind where I was at a time in my life." I think jazz singers have to have love tire treading to sing these songs in the American songbook with honesty-it's the icing on the singing jazz cake when aging benefits you. 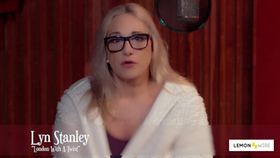 Lyn Stanley's discography includes: Lost In Romance (debut), Potions [from the 50s}, Interludes, The Moonlight Sessions Volume One and soon to be released, Volume Two (August 15, 2017 release date). A single, Little Drummer Boy is also available on CdBaby.com. Her distribution is through CDBaby.com, Amazon.com, ElusiveDisc.com, Target.com and fine audio websites. 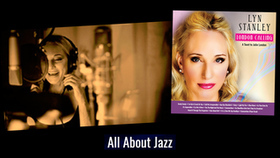 A former corporate marketing executive, Southern California vocalist Lyn Stanley has produced this, the first of two volumes that is directed not simply at jazz enthusiasts but also audiophiles, with SACD, hi resolution downloads, high end 45 RPM vinyl editions and even 15ips reel to reel tapes. 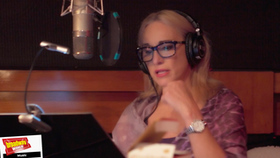 She certainly has assembled a stellar cast of play- ers for this recording session: pianists Mike Garson, Christian Jacob and Tamir Hendelman, guitarist John Chiodini, bassist Chuck Berghofer, drummer Joe La Barbara, percussionist Luis Conte, harmonica maestro Hendrik Meurkens, tenor-saxophonist Rickey Woo- dard, and trumpeter/trombone player Chuck Findley. Garson, Hendelman, Jacob, Chiodini and Doug Wal- ter provided the arrangements on the standards and adaptations of pop songs. Stanley is a marvelous song stylist as opposed to a scatting jazz vocalist who delivers a program of "All or Nothing at All," "My Funny Valentine," "Embraceable You," "Why Don't You Do Right," "Crazy," "Close Your Eyes," and "in the Wee Small Hours," with a soft, sultry voice and direct, clean articulation of the lyrics. Her natural phrasing and delivery also contributes to the wonderful performances, along with the marvelous musicians, such as Findlay's trumpet on the opening "All or Nothing at All," with wonderful piano and the brassy horn riffs. Woodard's tenor sax adds his magic to "Willow Weep For Me," as he embroiders her vocal with guitarist Chiodini adding chords and fills.Meurkens adds his harmonica to a Brazilian tinged treatment of "Close Your Eyes," while harmonica and Chiodini's guitar to the lament, "How Insensitive, " that she sings in a heartfelt fashion. One here's a definite Peggy Lee influence on her rendition of "Why Don't You Do Right?' that opens with finger-snapping, bass and guitar before La Barbara lightly brushes with Berghofer taking a solo and the choice of the Willie Nelson penned Patsy Cline hit, "Crazy," is an inspired choice with Berghofer opening playing the opening line before the band comes in with a juke joint feel and Findlay and the horns contribute extra spice. Another softly sung late night lament, "In the Wee Wee Hours," with Meurkens' harmonica comple- mented by Chiodini's guitar accompaniment and La Barbera's brushes providing the right atmosphere for this marvelous closing performance on a wonderfully sung, played, and recorded album of sophisticated jazz vocals.